It's cold. It's rainy. It's a great day for an at home workout! It’s cold and rainy, but that’s not an excuse to lay on the couch all day. Try this quick and effective head to toe workout that uses nothing more than your body! Do each move for 1 minute (allow yourself 15-30 seconds of rest between moves. Repeat up to three times. 12 minutes of an intense, wakeup workout. I made breakfast during my 10 second breaks...tons of veggies omelets and oatmeal for the whole family...enjoy! Yet another substitute for pasta! We love making pasta dishes in our house (my boys could eat them every night), but if you, like me, are trying to steer clear of gluten or carbs or calories in pasta, here is what I'm using as "spaghetti" under my chunky, tons of veggie spaghetti tonight. 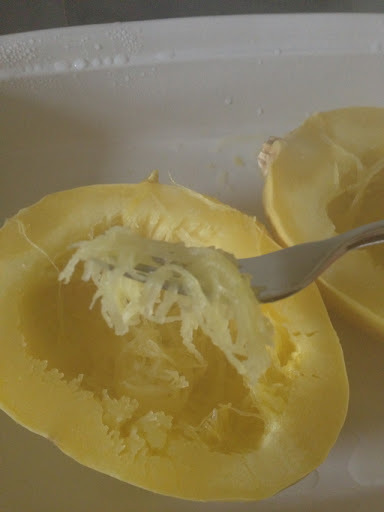 Spaghetti squash even has the word "spaghetti" in it, so I think it's the perfect substitute! Treadmills provide a very functional exercise…walking and running. We do at least one every single day…hopefully a lot. Treadmill workouts are the best indoor training equipment if you are training for a walk or run. They provide various programs with speed and incline to get your heart pumping plus treadmills control your speed so you can’t start slacking without turning down your mph. Treadmills are not low impact, however, so if you have knee and joint issues, you need to be careful. Just like you would pound it out on the pavement…you’ll pound it out on a treadmill. Ellipticals can come equipped with moving handle bars that you can push and pull with the upper body making this exercise a full body workout. They come with various programs based on resistance and incline but you control your speed. Elliptical machines are also low to no impact which means that they are great for people with joint issues such as knee problems. I thought that spring was here but now we are in the 30s and 40s again. So what's a mid west person supposed to do to keep warm? Make chili! Or at least that's what I did tonight for dinner. The recipe below is based on a Cooking Light recipe with my own changes to make it even healthier (and tastier). It makes 8 servings and is under 300 calories per serving and packs a whopping 33 grams of protein. It's also the perfect chili for the slow-carb dieter. In large stock pot, heat cooking spray over medium heat and saute onions until they begin to soften. Stir in chili powder, garlic and cumin until well mixed. Add in oregano and beans and mix well. Add chicken broth. Simmer, covered, for 20 minutes. Put 2 cups of the bean/broth mixture into a blender and blend until creamy (30 seconds or so). Pour puree back into stock pot, add turkey, tomatoes, lime juice and pepper. Love thick, meaty, yummy spaghetti sauce but can't do pasta for one reason or another (doesn't fit in your diet, gluten allergy, etc)? I found a pasta substitute! 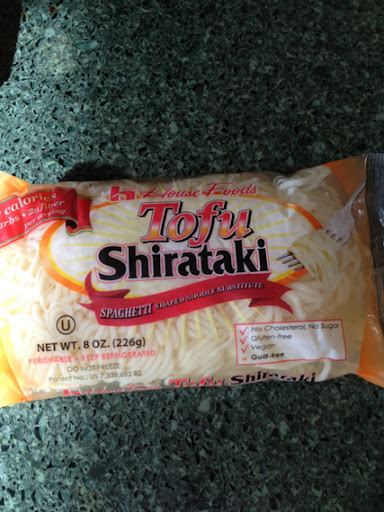 Shirataki noodles! They have 20 calories per 4 oz serving (or half a package), 1 gram of protein, 0.5 grams of fat and 3 carbs (2 of which are fiber). Here's the skinny: Buy them at the grocery store in the health food section or in the refrigerated pasta section. I recommend rinsing them well and then boiling them for 3 minutes to remove the "soy" smell and taste. And enjoy! 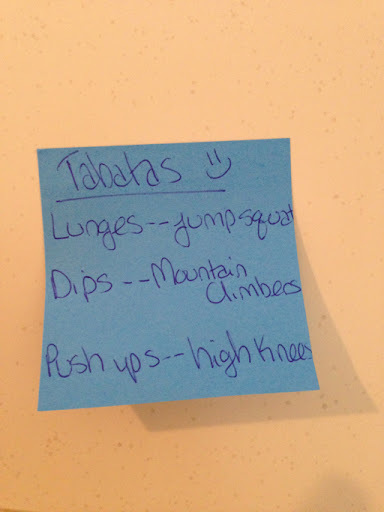 Happy Tabata Tuesday! 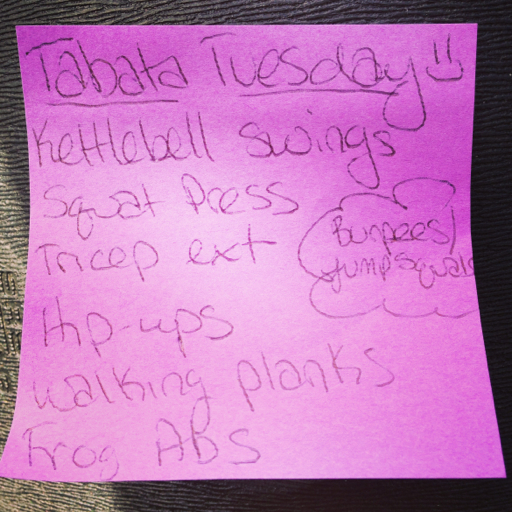 Do this workout "tabata style." That means 20 seconds of the exercise and then 10 seconds of rest for a total of 8 times (four minutes). I have added a bit of cardio to spice it up...do burpees during your first 20 second work section and jump squats at the last 20 second section of each Tabata. The whole workout should take you less than 30 minutes!